Description Chemical name: trans-4-[(3,5-dibromo-2-hydroxybenzyl)-amino]cyclohexanol hydrochloride monohydrate. Bronchial mucolytic agent which increases secretion of the serous cells in the glands of the nasal, tracheal and bronchial cells and in type II alveolar cells. Surfactant stabilises alveoli, protects the respiratory epithelium from the adhesion of virulent bacteria and supports phagocytosis. Sputolysin compensates for any reduction in pulmonary surfactant (reduction of surface tension in the alveolar region) during stress, e.g. hunger, transport, cold or during infection or pneumonia. Sputolysin has been shown to have a cough suppressant effect comparable to that of codeine. It increases antibiotic levels in the bronchial section and pulmonary tissue. It has been administered concurrently with a range of antibiotics and antibacterials. 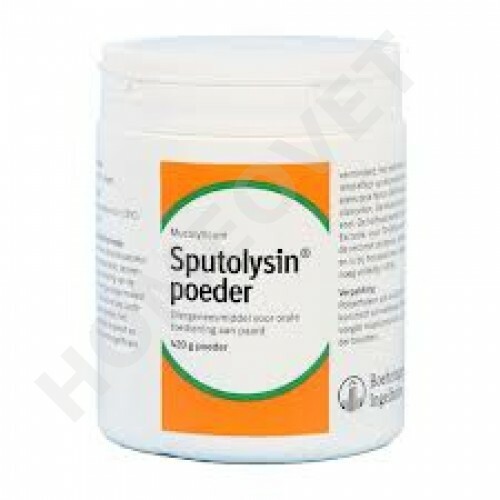 Treat bacterial infection with an appropriate antibiotic or antibacterial; Sputolysin is compatible with antibiotic preparations presently available. Do not mix with other injectable solutions. Withdrawal Period Meat 28 days. Dosage and Administration 0.3 mg active constituent/kg bodyweight twice daily in the food. Adult horses (500 kg). 30 g. Small horses, ponies, foals. 10 g for twelve to 14 days, or at least three weeks in chronic cases. 1 measure = 5 g.
During therapy increased nasal discharge, change from dry to moist cough together with a reduction in coughing will be observed. 2 x 6 scoops daily. Enter the powder with meals in the diet. For ponies and foals ensprechend adjust the dosage is the weight. Bgeginnendem animals with pulmonary edema as well as animals with kidney - and / or Leberfunkunktionsstörungen it must not be given!